As a former art school student, when I saw the Colorful Palette Artist’s Collection from the Salon line of Bonita Colors, I had to grab a handful to add to my collection. The Colorful Palette Artist’s Collection consists of eight shades named after historical artists or their well known work. I have four from the collection, and as soon as I can get back to a Rite-Aid, I plan on picking up another one or two. I found the formula on these somewhat variable, but nothing too unacceptable. These shades all dry down to a satiny finish, some with noticeable grit, but a nice application of Seche Vite made things smoother, and I actually preferred all four colours that way. Please forgive the slight square bump on my nails. I obviously didn’t buff down that silk wrap patch as well as I should have. You can view pictures of my first four choices with and without topcoat after the break. Dali’s Memory is a pale minty teal that makes me feel like I have very pretty hands. It was the first one I swatched, and I found it to be the most problematic. It felt gritty as I was painting it on, and the silver flecks all but disappeared on the nail as two coats dried down to an unexpected satin finish. I wanted to see how it looked shiny, so I tossed on two coats of Seche Vite to amp up the gloss and tone down the grit, and I was well rewarded. Adding a glossy top coat uncovers some of the hidden shimmer, and makes me feel absolutely gorgeous. I was sad to take this off to move on to the next swatch. 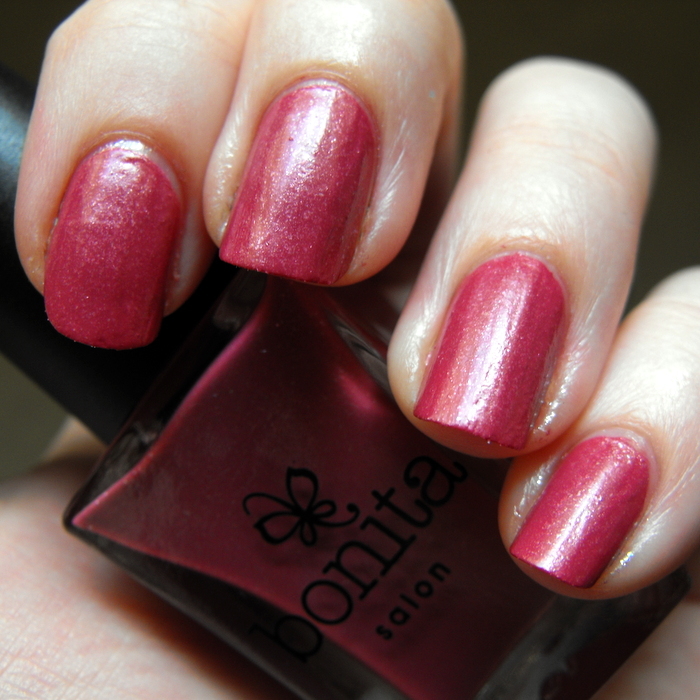 Monet’s Garden is a deep rosy pink with silver shimmer/flecks. This polish was still gritty, but less so than Dali’s Memory. I did get little jaggy bits along the edges of my nails from the shimmer, but they laid down nicely after I put on my two coats of Seche Vite. Topcoat brings out the shimmer in all of these polishes. I feel like it’s a nicely appropriate rose tone for the fall. Rembrandt’s Muse is a vampy dark cranberry with silver shimmer/flecks, and you can see the grit in these pictures. I found that the flecks in this polish were a little less evenly sized, so they really stood up from the nail. This is really a me colour. I have a penchant for this sort of deep cranberry red, even when it gives me a little bit of staining around the cuticles. Be diligent with your clean up with this one. Topcoat brightens this polish up and smooths out the grit., and looking at this shiny picture makes me want to put it on as a full manicure right now. Starry Night is a deep blackened teal (the colour is more accurate in the topcoat picture). 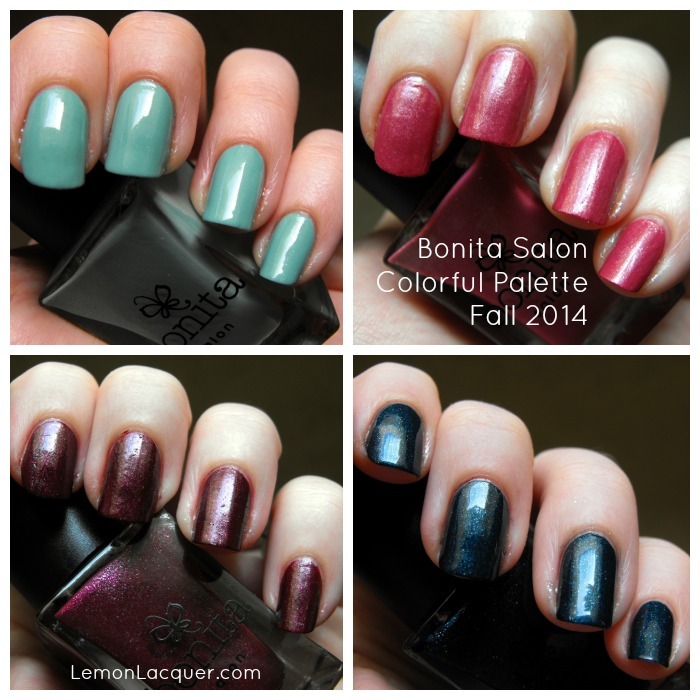 It is definitely brighter and more teal than the Bonita Salon Witch’s Ball Collection polish Eat, Drink, and Be Scary. Again with the grit in this polish, and you can see I had a little more trouble with clean up on this one. This felt the nicest to paint on though, it applied more smoothly than the others and aside from a little roughness from the glitter, it levels pretty well. Adding a couple coats of top coat brings out the shimmer like a real starry night, and it makes me want to do galaxy nails with this one. My favorites from this fall palette are Starry Night, and Dali’s Memory. I love me some dark nail polish, but that pretty pale teal makes me feel very elegant, and isn’t nail polish all about making you feel happy anyway? Have you picked up any of these from your local Rite-Aid? Which one is your favorite?